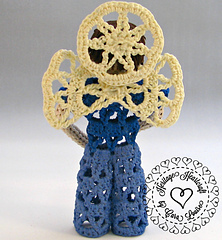 I love to create small angel designs which can be completed in only a few hours of work. Delta, one of my earlier designs, seemed to really speak to me that she wanted a big brother. Del is a Romani (Gypsy) name meaning ‘he gives’, and this spunky little boy angel has sure been giving me a lot of smiles while working on him, and I hope he does the same for you! 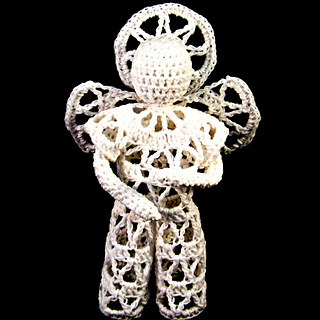 Worked all in white, or personalized with some favorite colors, your angel can be as traditional or modern as you wish. Made in size 10 thread, he stands under 5 inches tall. A heavier weight thread, such as size 5 or 3, or baby, sport, or sock weight yarn may also be used. Increase your hook size appropriately. 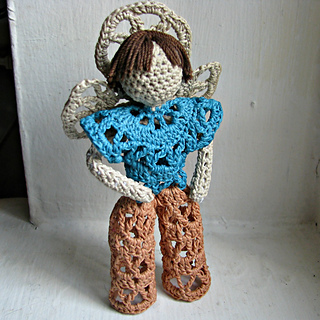 Angel worked in size 3 thread, he would be about 7 inches tall or so.